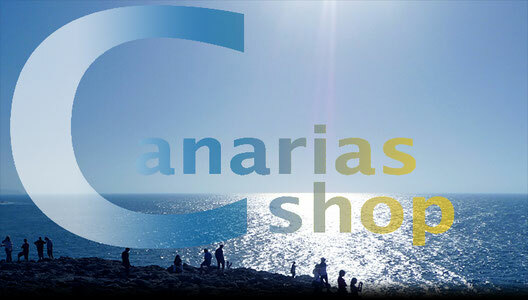 LANZAROTE DATEN, FAKTEN & NACHRICHTEN - CanariasShop.de: Ihre Kanaren zu Hause! Informationen, Erinnerungen und Geschenke für Kanarenfans. Lanzarote ist die östlichste der kanarischen Inseln. Neben ihr liegt das sog. 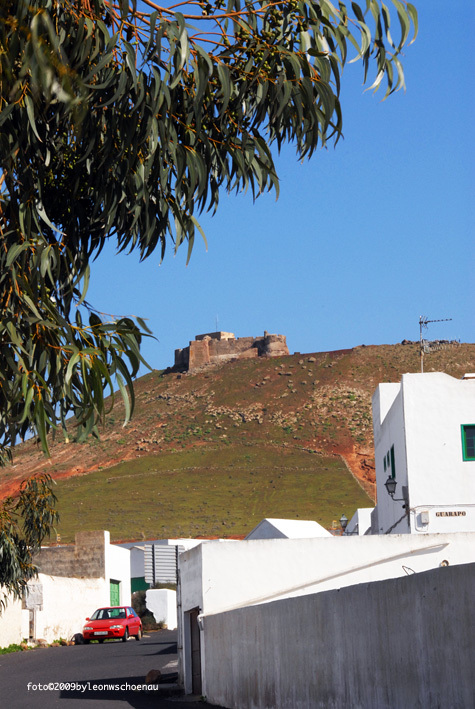 Chinijo-Archipel, das aus den unbewohnten Inseln Alegranza, Montaña Clara, Roque del Este, Roque de 0este und der einzigen bewohnten Insel Graciosa. Die gesamte Insel Lanzarte wurde zum Weltbiosphärenreservat erklärt. 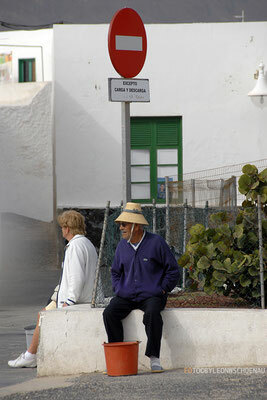 Cesar Manrique (24. 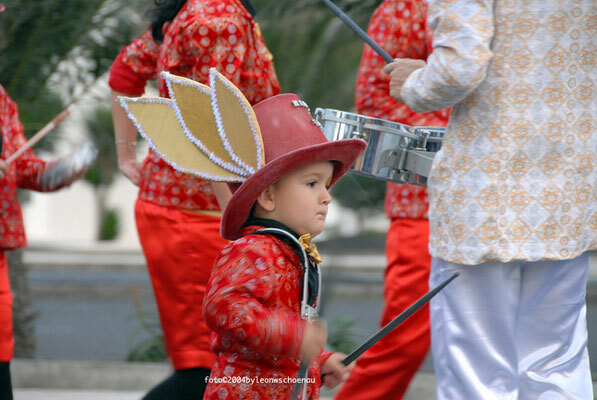 April 1919 in Arrecife, Lanzarote, Spanien; † 25. September 1992 in Tahíche, Lanzarote) der wohl bekannteste Künstler der Insel, hat hier bleibende Eindrücke hinterlassen, die zu den künstlerischen Sehenswüdigkeiten der Insel gehören. > Besondere Naturlandschaften sind: La Corona, Los Ajaches, La Cueva de Los Naturalistias, Islote de Halcones. 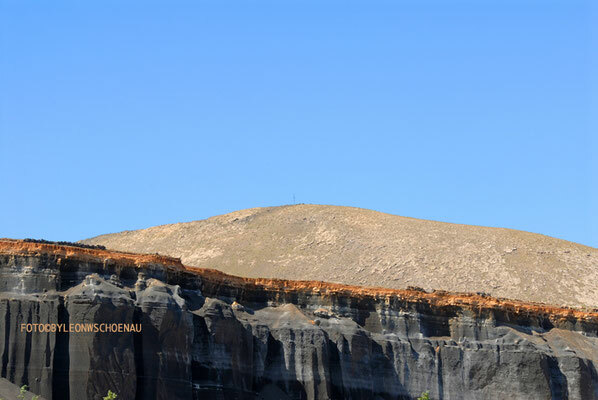 > Geschützte Landschaften die Gegenden um Tenegüime und La Geria. 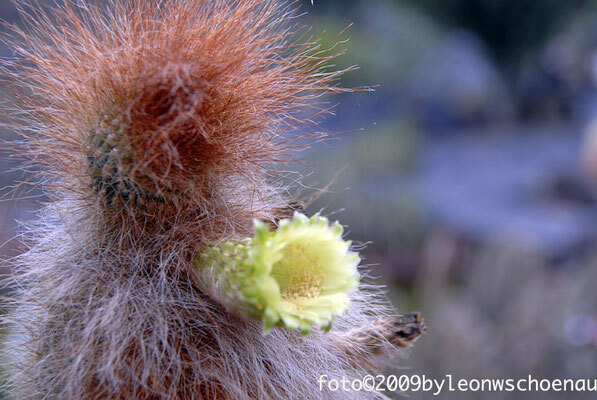 > Orte von wissenschaftlichem Interesse: "Los Jameos" und Janubio. > Naturparks: Chinijo-Archipel und die Vulkanlandschaften. 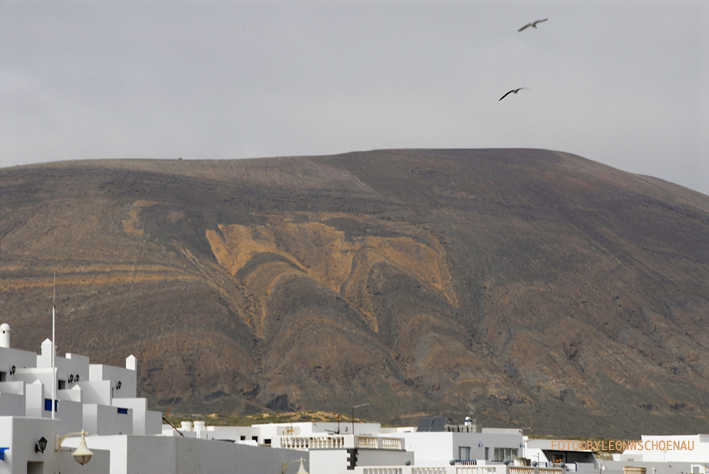 > Maritime Naturschutzgebiete: Die Nebeninseln La Graciosa, Alegranza, Montaña Clara, Roque del Este und Roque del Oeste. 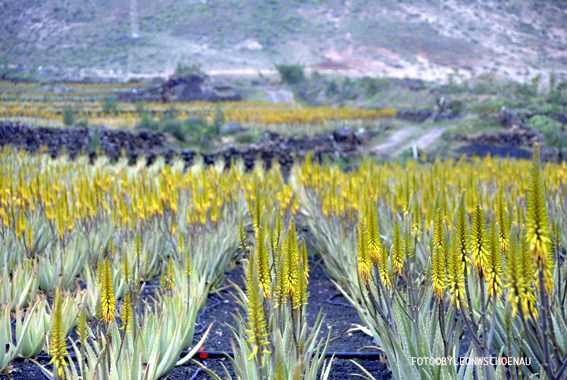 Repräsentative Flora: gelbblühende Margariten, Besenginster, Aeonium canariense. Repräsentative Fauna: Gecko, Kanarische Kragentrappe, Fischadler der Unterart "Pandion haliaetus carolinensis, Albino-Krebs, Kanareneidechse, Gelbschnabel-Sturmtaucher, Fischadler. Hauptstadt: Arrecife. Die ihr gegegnüberliegenden fesligen Riffe hgaben der Stadt ihren Namen, sie schützen gleichzeitig von den starken Meeresströmungen. Die Stadt entstand um eine Salzwasserlagune herum, dem "Charco de San Ginés". 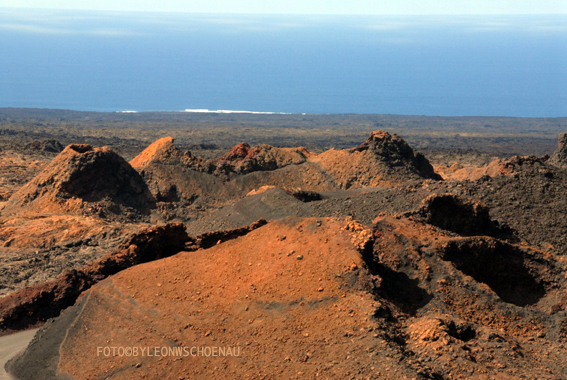 Arrecife ist die flächenmässig kleinste Gemeinde der Insel, im Hinblick auf die Bevölkerungszahl allerdings die größte. 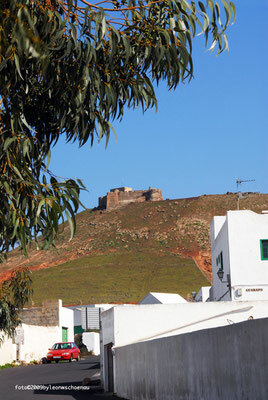 Anzahl der Gemeinden auf der Insel (7): Arrecife, Haría, San Bartolomé, Teguise, Tias, Tinajo, Yaiza. 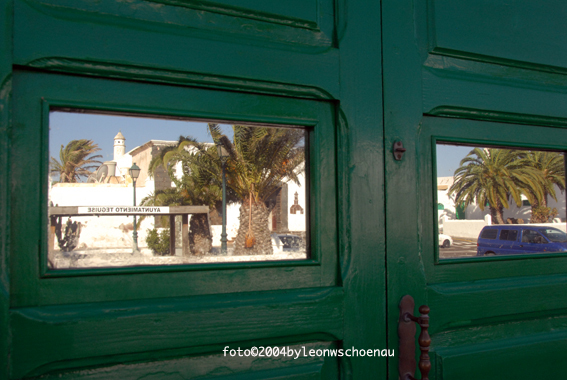 Passgagierhäfen (4): Hafen von Arrecife, Hafen von Playa Blanca, Hafen von Órzola und Hafen von Caleta de Sebo. 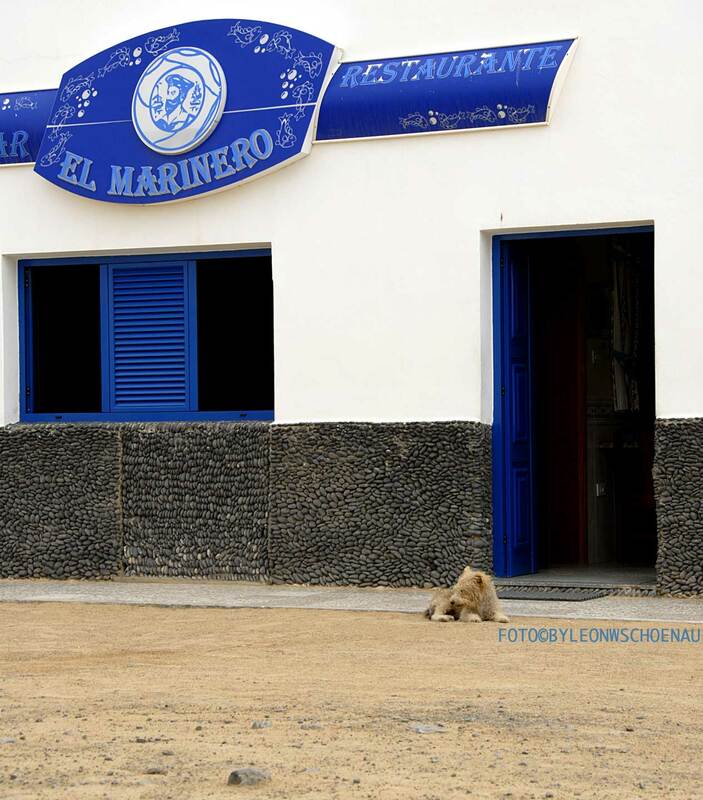 Sport- und Yachthäfen (6): Puerto del Carmen, Caleta de Sebo, Playa Blanca, Arrecife, "Marina Rubicón", Puerto Calero. Öffentliche Krankenhäuser (1): Inselkrankenhaus "Hospital Doctor José Molina Orosa". Universitäten(2): Studienzentrum "Centro Asociado de la Universidad Nacional a Distancia" (an die Nationale Fernuniversität angeschlossenes Studienzentrum) und der Campus von Lanzarote an der Universität von Las Palmas de Gran Canaria. Kongresszentren (2): Auditorium "Cueva de Los Verdes", Auditorium "Los Jameos del Agua". Golfplätze (2): "Golf Costa Teguise", "Golf Tias". 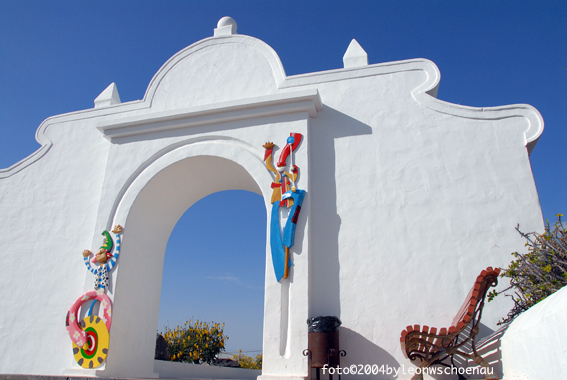 Museen (13): Museum über die Kanarische Emigration "Museo del Emigrante Canario", Museum "Palacio Sinola", Internationales Museum für Zeitgenössische Kunst "Museo Internacional de Arte Contemporáneo Castillo de San José", Archäologisches und Ethnografisches Museum "Castillo de San Gabriel". 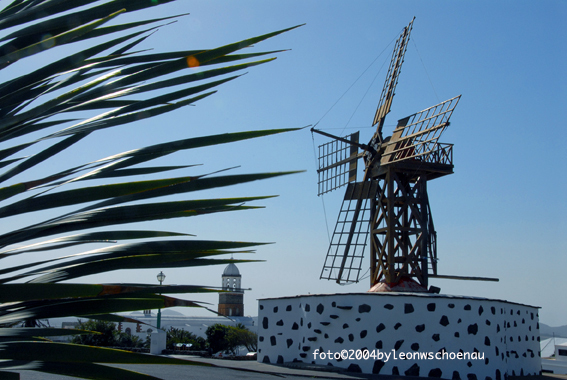 Landwirtschaftsmuseum "El Patio", Stiftung "Fundación César Manrique", Museum der Meeressäugetiere "Museo de Cetáceos", Ethnografisches Museum "Tanit", Luftfahrtmuseum "Museo Aeronáutico de Lanzarote", Mueseumshaus und Bauerndenkmal, Museum für Wissenschaft und Technik, Museum für Heilige Kunst (im Kloster Santo Domingo) und Museum "El Alemacén". Gastronomie: Geräucherter Lachs, Eintopfgericht "Sancocho", "Papas Arugadas" (Runzelkartoffeln) mit Mojo und Käse aus Lanzarote, frische Fischgerichte. Volksfeste: Karneval, "San Ginés", Fest zu Ehren der Schutzpatronin "Virgen del Carmen, "San Marcial", Fornleichnamsfeierlichkeiten "Corpus Christi", Johannisnachtfeste, Fest zu Ehren der Schutzpatronin "Virgen de Los Volcanes, Weihnachsfeste "Ranchos de Pascua". 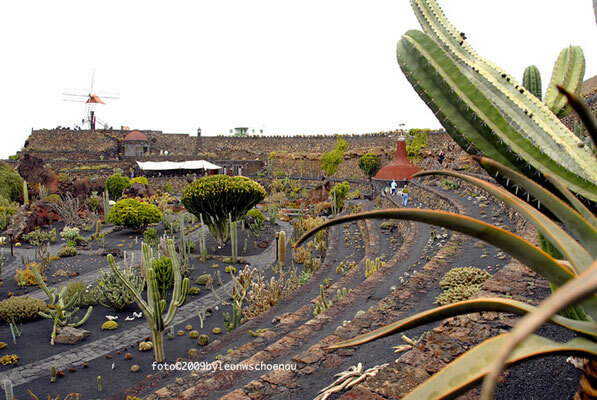 Sightseeings mit hohem Besucherinteresse: Strand "Playa del Papagayo", "Jameos del Agua", "Cueva de Los Verdes", "Los Hervideros", Yaiza, La Geria, Famara, Nationalpark Timanfaya, Stiftung César Manrique, Kaktusgarten "Jardin de Cactus" (angelegt von Manrique). 13.01.2017. 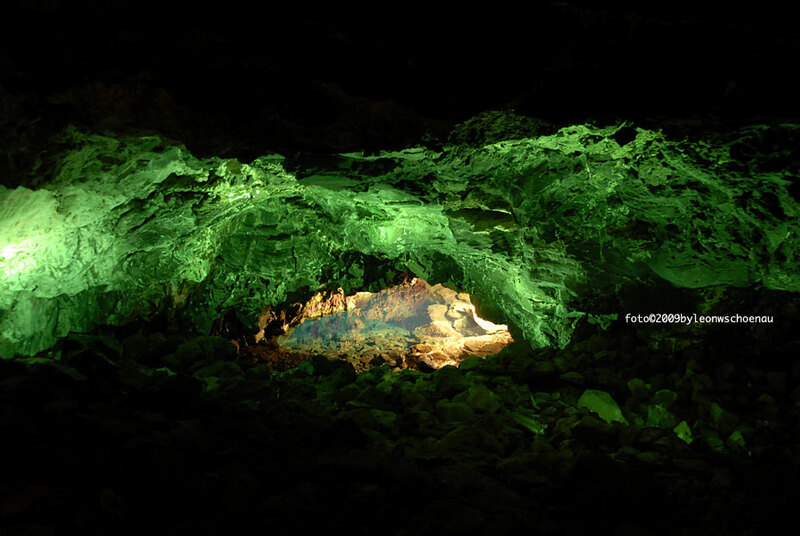 NEUES AUS DEM UNTERWASSERMUSEUM ATLANTICO IN LANAZAROTE. 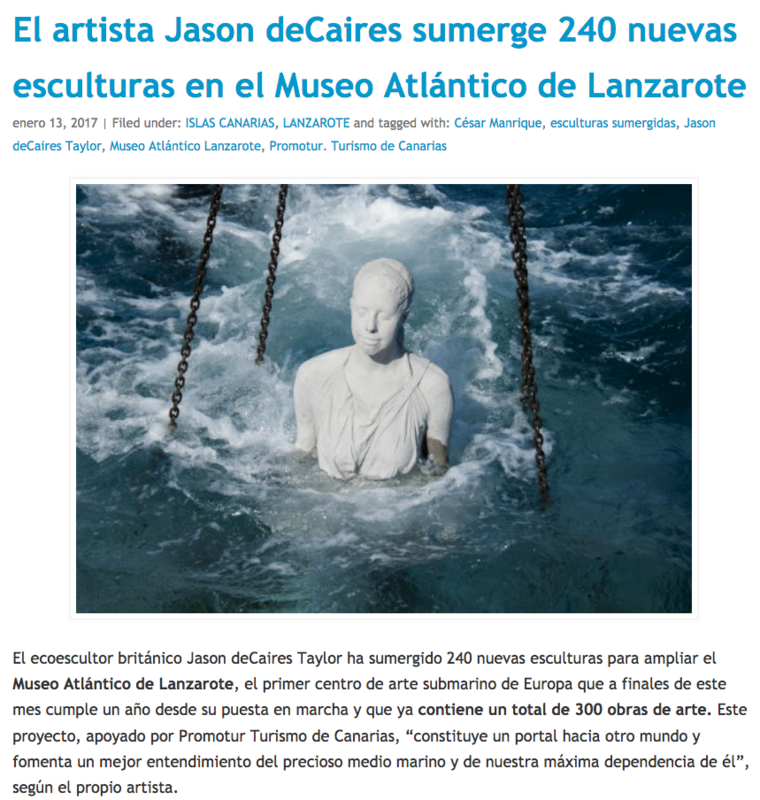 Der britische Bildhauer deCaires Jason Taylor hat mit 240 neuen Skulpturen Atlantic Museum Lanzarote erweitert. Damit besitzt das erste Unterwasser-Kunstzentrum Europas rund ein Jahr nach seiner Eröffnung insgesamt 300 Werke. Der Künstler sagt selbst, dass "dieses Museum ein Portal in eine andere Welt (ist) und so ein besseres Verständnis bringt für die Meeresumwelt und unsere Abhängigkeit von ihr ..." Das Atlantic Museum Lanzarote, befindet sich quasi auf dem Meeresboden in der Bucht von Las Coloradas bis 14 Meter tief und hat eine Fläche von 50 Quadratmetern ... Das Projekt wurde von den Zentren für Kunst, Kultur und Tourismus des Cabildos von Lanzarote gefördert und ist dessenNetzwerk aufgenommen wird. Es hat auch eine Kofinanzierung der Regierung Kanarischen Inseln erhalten. 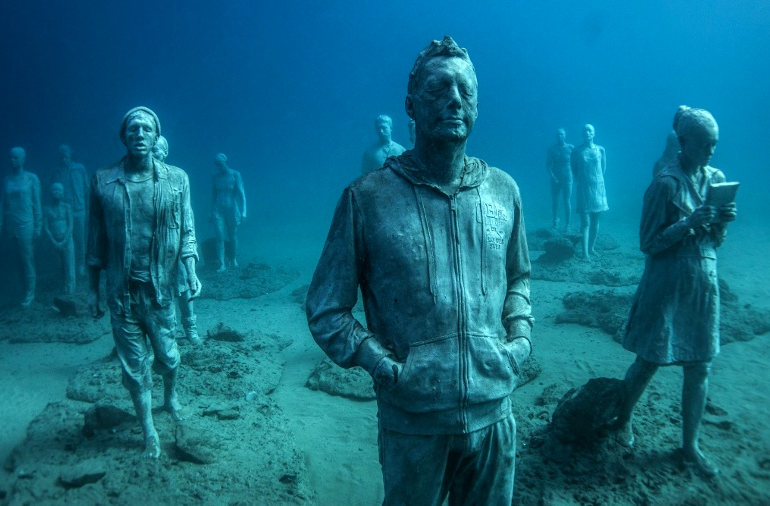 (Source: Photo by Jason de Caires Taylor) : Thema "Prozession auf dem Meeresgrund". 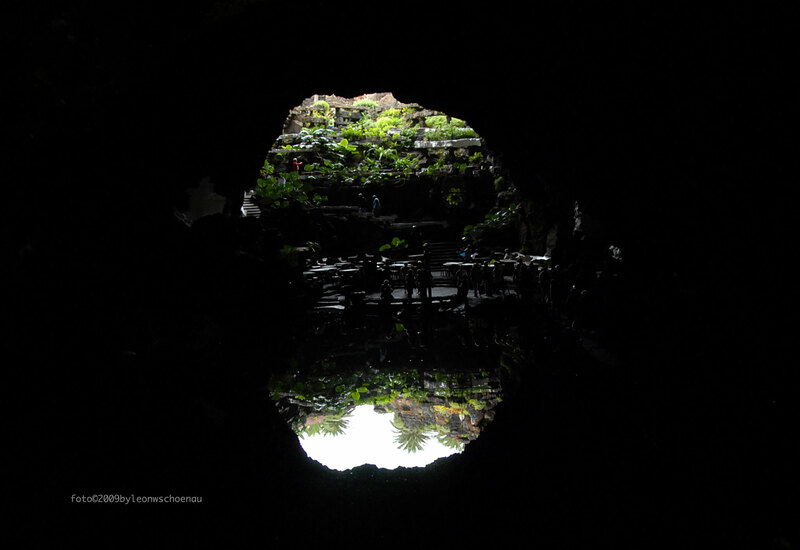 Die Installation "El Rubicón" ist Teil des neuen Unterwassermuseums vor Lanzarote. LANZAROTE: STRÄNDE - EINE KLEINE ÜBERSICHT, AUSGEWÄHLT VON "LANZAROTE-INFORMATION"
El Castillo beach is on the end of Leon y Castillo, the main pedestrian street in the centre of Arrecife where the Castillo de San Gabriel is situated. 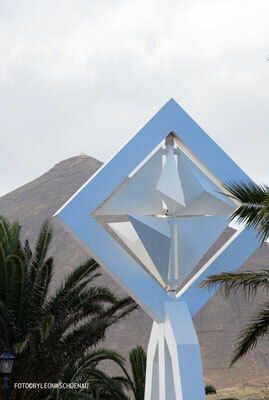 El Reducto beach is the one that you see on the main coast road, next to the Gran Hotel. This beach is very popular with locals but there are also a number of hotels offering city breaks along the front for tourists looking for a more Spanish holiday too. 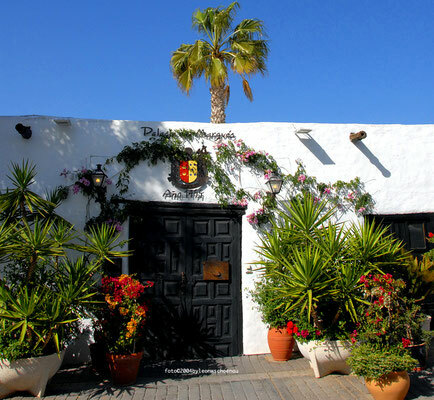 El Cable beach is situated mid way between Arrecife and Playa Honda, access is of the main carriage way where the petrol stations are situated opposite each other, or along the promenade. Not a popular beach as it can be polluted occasionally. La Concha beach is further towards Playa Honda from El Cable. 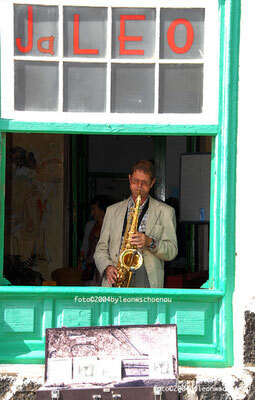 Accessed from Playa Honda or along the promenade from Arrecife. 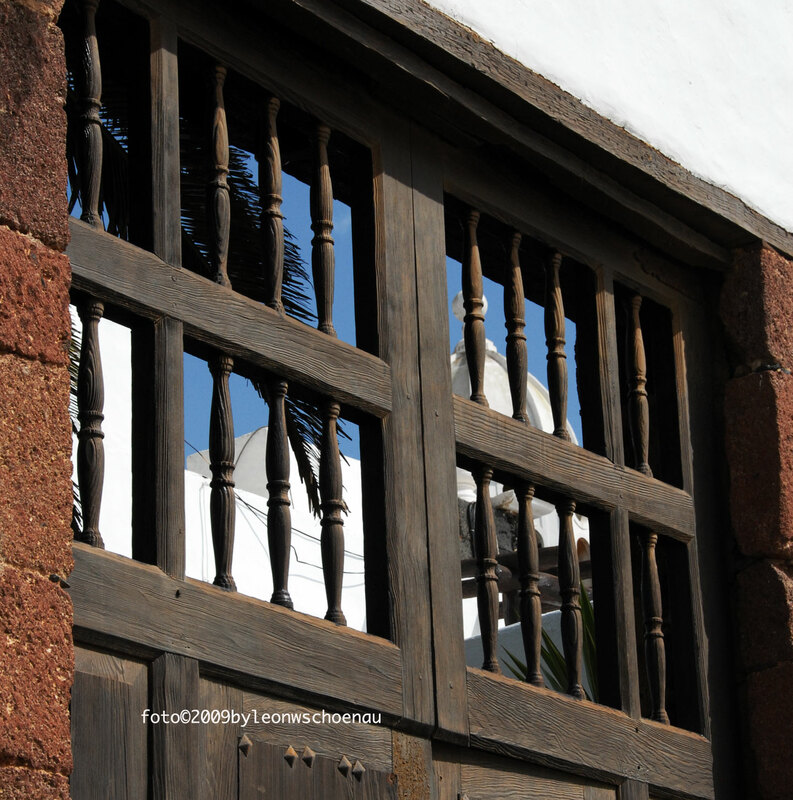 Arrieta, Playa La Garita is the islands best kept secret! This beach is great for all occasions, it has a good swell for surfers, great snorkeling under the jetty, fishing off the pier and two tapas bars. Overnight camping not permitted but tolerated on the furthest section of the beach. El Charcon beach is the small one with a natural sea pool next to Casa Juanita in Arrieta. Sand: description says fine white but no sand! Las Sebas beach is the other end of Punta Mujeres, there are two sea pools, a slipway and lots of locals fishing. Sand: description says fine white with rocks, but I would say rocks! Los Caletones beach is along the coast path from Punta Mujeres to Jameos del Agua. Caletón Blanco Beach is the largest of the shallow water and white sand beaches that appear on your right as you follow the road to Órzola. 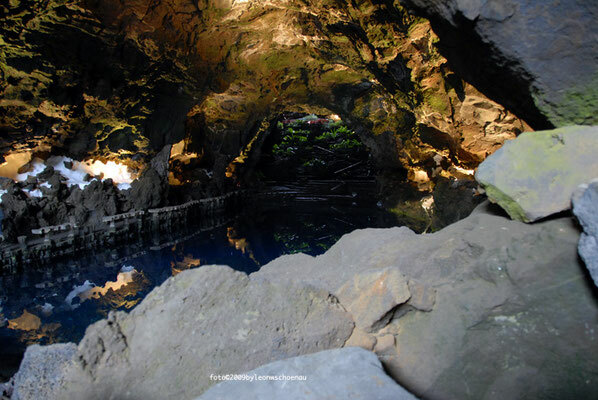 Great for children, lots of rock pools. 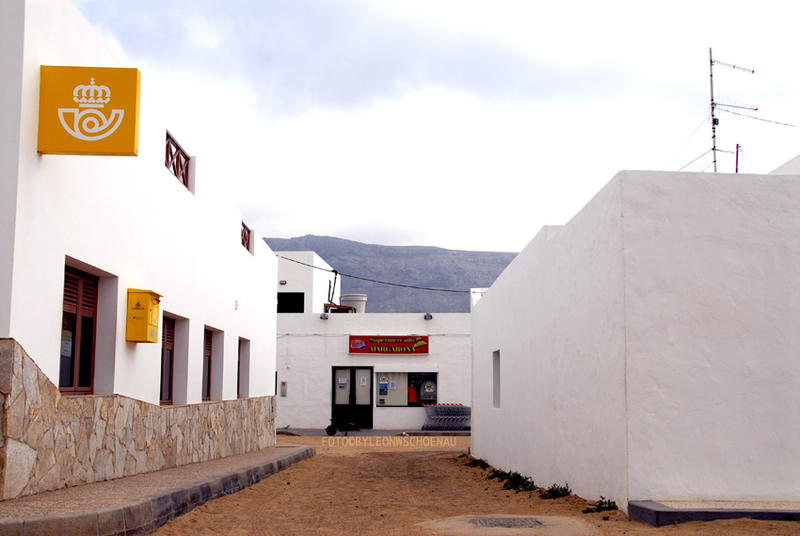 Close by is a naturist beach Caleta del Mero. La Cantería Beach is hidden under the dramatic cliffs at Órzola. Access is by car along a dirt track, as you turn right from the coast road into the village turn left to find the beach. 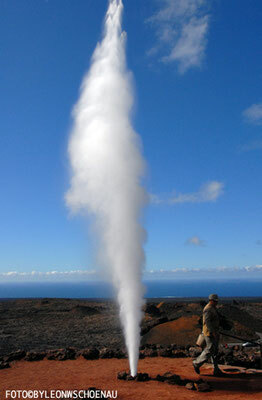 Often used for overnight camping and popular with surfers. El Risco beach is deserted but beautiful! Access is via boat or down the goat path from the car park along from the Mirador del Rio towards Guinate. The definitely beach is worth the trek down but remember the only way back is up and its 650m!! 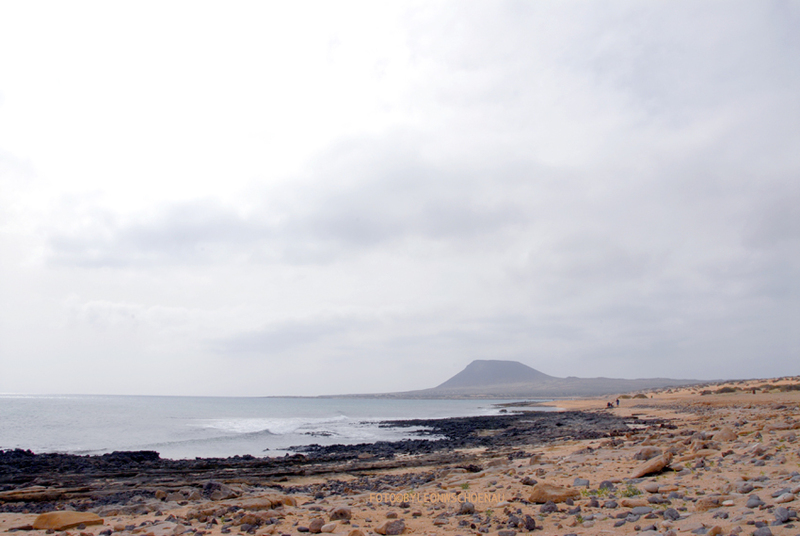 The annual swim to La Graciosa starts here each September. The first is Playa Honda beach, it's huge and stretches along the popular promenade. The second beach is Guacimeta beach and it stretches around the airport runway, you can stand and watch the planes land over your head! Not classed as a naturist beach but is known for it. 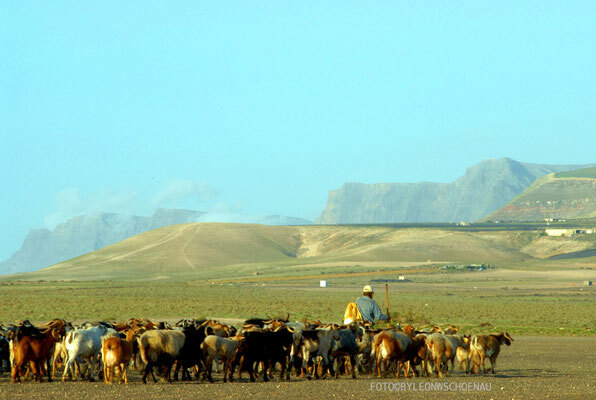 The municipality of Teguise covers a wide area, Costa Teguise, Famara and La Graciosa. 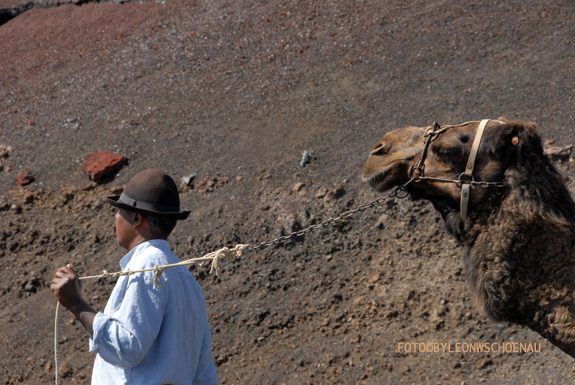 Costa Teguise has some very different beaches accessed from the promenade. Las Cucharas beach, considered the main beach and very popular for windsurfing especially with the wind increase in the afternoons. Los Charcos beach, sheltered from the wind. El Jablillo beach, sheltered cove and popular with children and try scuba divers. 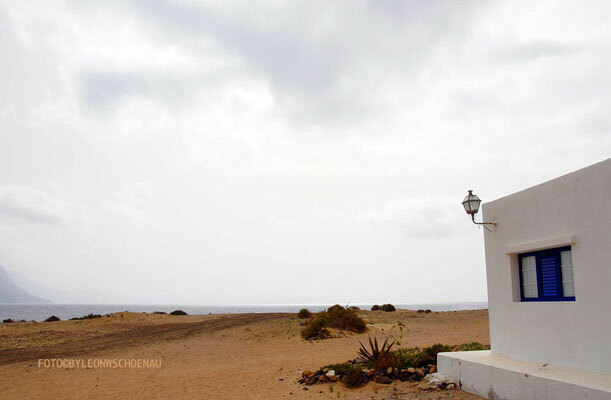 La Caleta is situated past Costa Teguise heading towards Arrecife, just before the desalination plant is the beach of Ensenada de La Caleta. Great local tapas bars! Barlovento beach is where the boat has been beached after the desalination plant. La Arena beach is between Puerto Naos and Castillo San José, access is via the road to the Castillo and there is a turn off on the bend before. Famara is impressive, the beach stretches for nearly 6km and you can't help but be in awe of the magnificent Famara cliffs. Swimming is dangerous, there are strong waves and under currents making it popular with surfers. Also attracts kite surfers and experienced windsurfers. 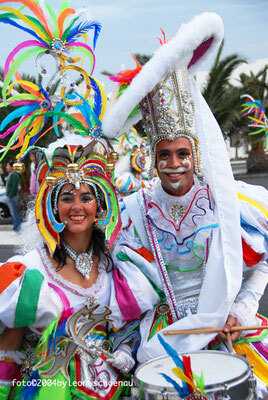 Caleta Caballo beach is along the coast, close to the sports holiday complex, Club La Santa. Sand: description says fine white photo shows black rocks! La Graciosa is a small island but it has 8 beaches in the area known as Chinijo Archipelago. Many of these beaches are isolated and only accessible on foot. 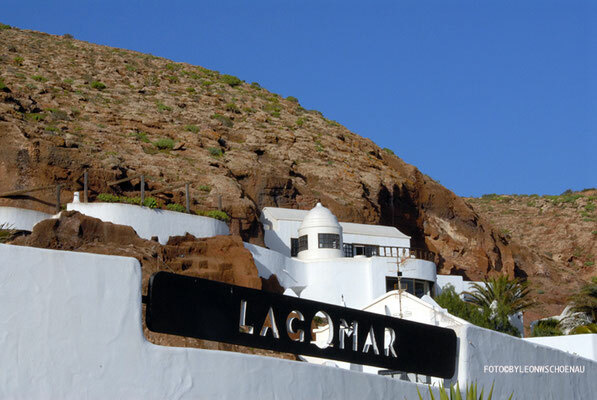 This covers the Puerto del Carmen resort with over 6km of beaches from Matagorda to the old harbor. Los Pocillos beach, a deep beach with wind so good for windsurfing and flying kites. 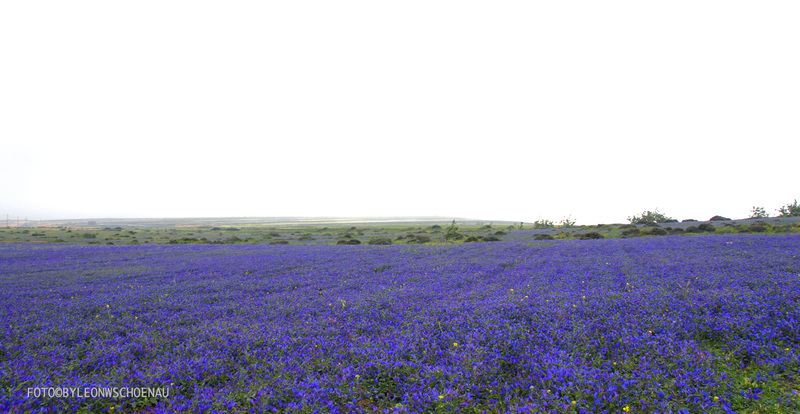 Matagorda beach stretches from Los Pocillos around the Matagorda commercial centre. Lima beach offers sheltered positions, some rocks. Good snorkeling and conditions ideal for beginners windsurfing. La Peña Grande is a thin strip of beach. Pila de la Barrilla beach, known as Playa Chica, just past the Fariones very popular with scuba divers and watersports hire. Fariones beach, situated next to Playa Grande and the Fariones hotel. La Santa beach is on the La Santa island, popular for picnics and BBQ's and the lagoon is great for small children or learning to windsurf. La Boca de Abajo beach, situated just past Club La Santa. The beaches are accessed by a dirt road off the large roundabout on the road to Femes, public are asked to pay an entry fee of €3 Euros and residents with are free of charge. You can also take a water taxi or catamaran trip to reach these beaches from the resort. There are a number of boat excursions that anchor off Playa Mujeres and Las Coloradas as they are the larger beaches. 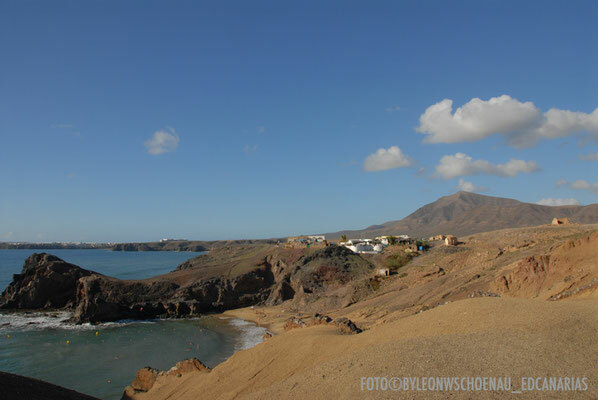 Papagayo is also popular with naturists. 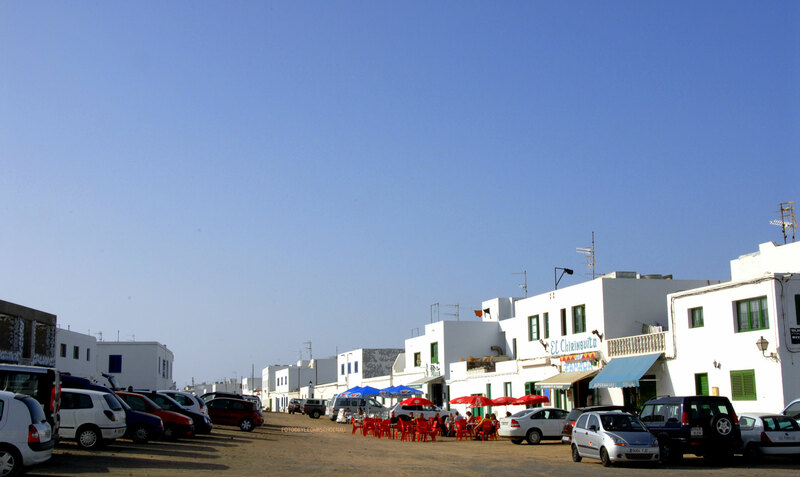 Playa Blanca beach is situated in the centre of the resort, where the old village was. Playa Dorada Beach is between the centre and the Marina Rubicon port, it's a popular beach with water sports available for hire. Flamingo Beach can be located past the old harbor towards the lighthouse. 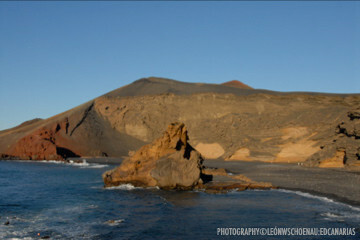 El Golfo beach is the one you see on the postcards with the green lagoon called Charco de los Clicos. 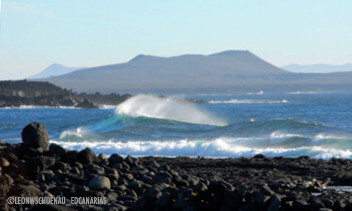 This coast is windy with strong waves, there is also a beach of 125m x 15m in the village of El Charco. Janubio beach is next to the Salinas just off the main road from Yaiza to Playa Blanca where you turn for El Golfo, here you can find lava rock with the green olivina inside. Its not a beach but you should stop at Los Hervideros along this coastline (Janubio - El Golfo) to see the strong waves pound into the caves and blow holes. Montaña Bermeja beach, situated along the coast to El Golfo. Playa Quemada is hidden away between Puerto Calero and Playa Blanca, an untouched Canarian village with good restaurants.